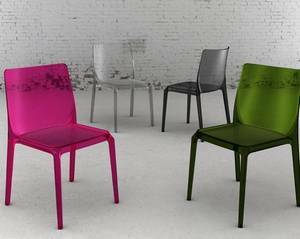 Description A stackable polycarbonate chair with a strong personality, available in opaque and transparent colours. The seat has a textured surface to avoid any unsightly scratches. The shape of the chair is familiar but modern, this along with the variety of available colours allows this chair to fit comfortably into any environment. Recessed seat cushions are available, please call for fabric options and prices. Up to 6 chairs can be stacked together. Blitz was the new chair at this years Milan fair that really caught our eye. A great mix of practicality and funky design, the seat has a textured finish and the legs taper gently towards the floor. The variety of colours gives this chair a wide range of identities, chose from subtle opaque colours for a touch of class or bright and zany transparent colours to make a real statement. Shipped in boxes of 4 of the same colour, if you require smaller quantities or would like to mix colours please call for prices and availability.